Karaite scholar and liturgical poet; flourished at Belgrade in the first half of the sixteenth century; grandson of Abraham ben Judah. He copied and completed the exegetical work of his grandfather, entitled "Yesod Miḳra," and was the author of liturgical poems, several of which have been inserted in the Karaite prayer-book ("Siddur ha-Ḳera'im," ii. 215; iii. 171, 172, 174). 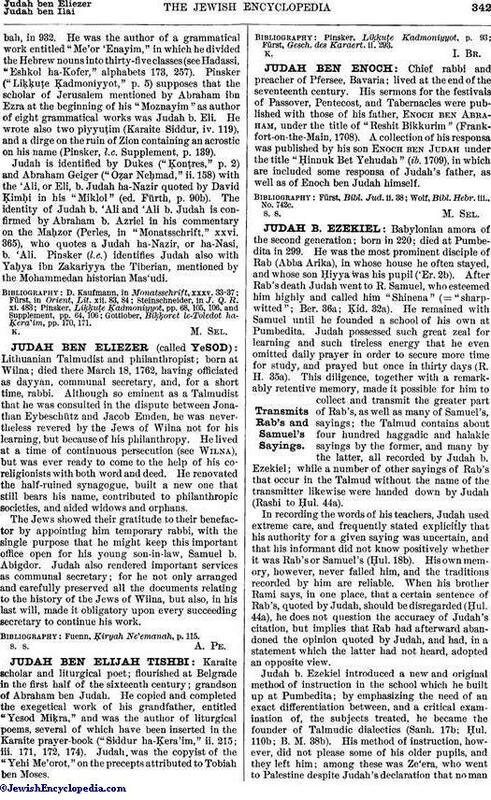 Judah was the copyist of the "Yehi Me'orot," on the precepts attributed to Tobiah ben Moses. Fürst, Gesch. des Karaert. ii. 293.